It’s been just a week, and Donald Trump’s use of executive orders, even when the GOP has full control of both the House and Senate, is the clear sign of an insecure authoritarian comfortable with bypassing democracy. It’s also a showboat move from the reality star. With a single stroke, he creates law. The legitimate president has a real problem with his own legitimacy, hence his quibble over crowd size or his complaints about 3 to 5 million people voting illegally when there’s no proof of that whatsoever. Maybe they’re the same phantom folk who attended his inaugural? Fortunately, many of King Donald’s executive orders in the first weeks can still be challenged, in the same way Republicans blocked Obama’s expanded Deferred Action for Childhood Arrivals (DACA) and the new Deferred Action for Parents of Americans (DAPA). It just means more work ahead for all in the first hundred days, as Trump tries to bulldoze and shape a new political landscape. Bannon may have been referring to the traditional media, but in this digital age, everyone is media, much the same way the Tweeter-in-Chief likes to be his own media expressing his presidential views in 140 characters. He’s not shutting up, as the president of Mexico found out this week. If Trump won’t shut up, we can’t afford to either. That’s the two-way street Press Secretary Sean Spicer likes to talk about. It’s the way modern democracy works. 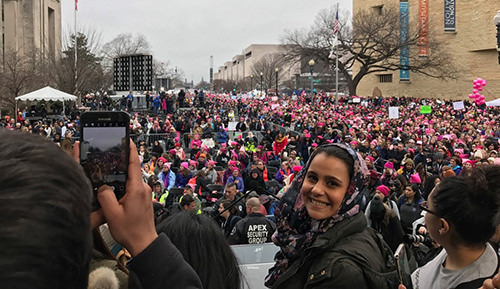 And the best example in week one was that Women’s March in D.C. and around the nation. 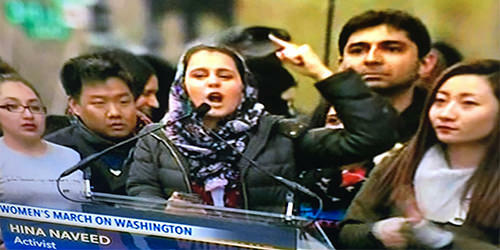 At the Women’s March, Madonna’s “F” bomb made news (the “F” did not stand for Filipino), but I was disappointed the networks cut away when Dream Action Coalition’s Hina Naveed had the mic. I caught Naveed, 26, a Pakistani immigrant from Dubai who became a beneficiary of DACA, on C-SPAN. She was flanked by a group of activists, including Tony Choi and Ivy Teng Lei. In my recent conversation with Naveed, we talked about Trump’s first week and what Dreamers and the community need to do now, as Trump conforms to campaign promises. 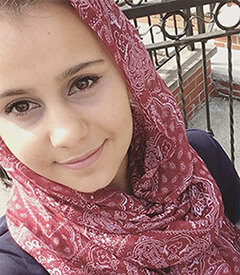 Listen to my podcast interview with Hina Naveed here: part 1 and part 2. 0:41 Hina talks about speaking at the march and is asked about her crowd estimate. 4:10 Coming to America and the common journey of DREAMERS. 6:00 Being undocumented and the anxiety that brings. 8:00 The president’s executive orders on the wall, sanctuary cities and immigrants. 9:00 The president’s harmful “Good Immigrant/Bad Immigrant” narrative. 0:23 More on the “Good Immigrant/Bad Immigrant.” Are Dreamers being manipulated? 1:23 The Bridge Act as an imperfect solution. 2:30 Trump’s targeting of Muslim communities and extreme vetting. 4:53 What she tells students, and how they should take care of their mental health. 7:15 The need for sanctuary cities, campuses, and safe places. 9:14 How people can take action in the fight for immigrants. 12:10 Why she speaks out, although not everyone can or should. Making a difference. Link here to part 1 and part 2 of the podcast.